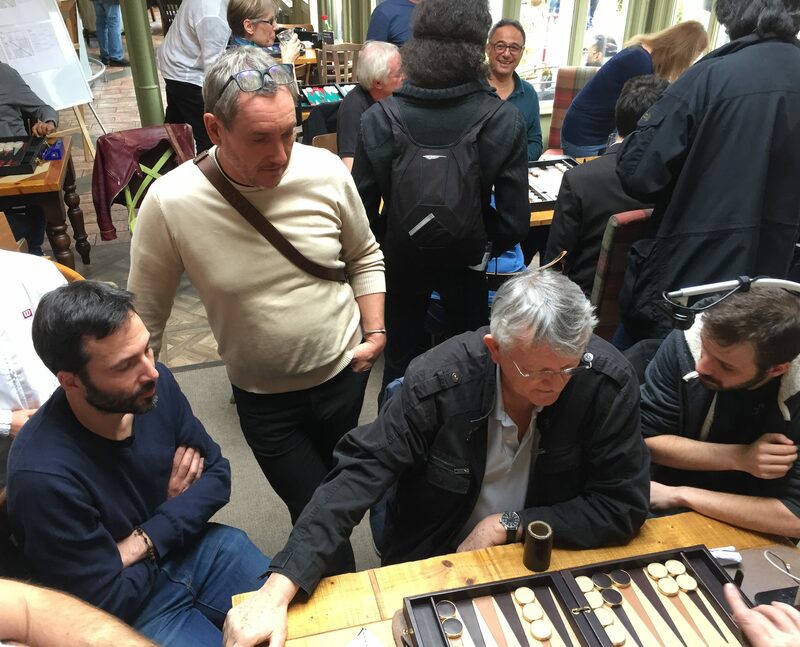 Last weekend a battalion of 14 backgammon players from Paris ‘invaded’ West London to challenge the same number of London players in the second London-Paris team event: a bit like 1066, but with backgammon boards instead of spears, battle-axes and bows and arrows. 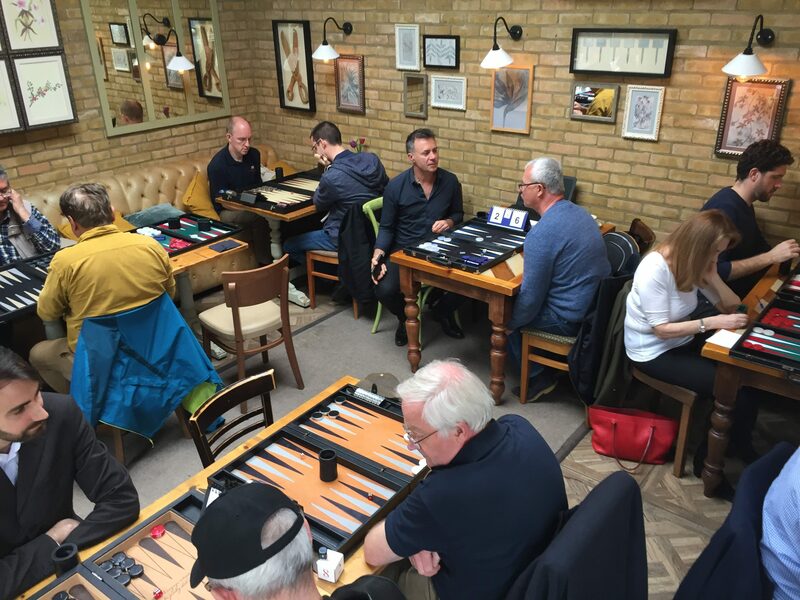 The venue for this momentous confrontation was The Grange pub in Ealing, and the event was masterminded by Eric Maillebiau – now most definitely a Londoner having lived over here for many years. Eric had organised the first London-Paris challenge in Paris a year ago, and this was the return match. To get a better feel for the atmosphere and camaraderie see the full photo album 2018 London-Paris in the UKBGF Flickr account. The format for each pair of teams was both a singles championship and a team tournament rolled into one, with all Paris v London matchups counting in both competitions. Match lengths were seven points throughout, with reduced clock settings to speed things along. Survivors from the Saturday triple elimination Swiss went into an 8-player knockout on Sunday, while those eliminated from the singles continued to do battle for their team. Full consultation team matches rounded off the weekend. Following the Swiss phase, a ‘truce’ was called on Saturday night. This enabled most of the combatants to take a trip on the tube to Leicester Square, and onwards on foot to our pre-booked restaurant in Soho, where there was much merriment and a not inconsiderable consumption of alcohol…. Back at the Grange on Sunday morning there were a few bleary eyes, but fortunately Geoff and David managed to hold things together. London A exacted their revenge for the mauling they had suffered in Paris a year earlier by convincing themselves that home advantage was a significant factor. 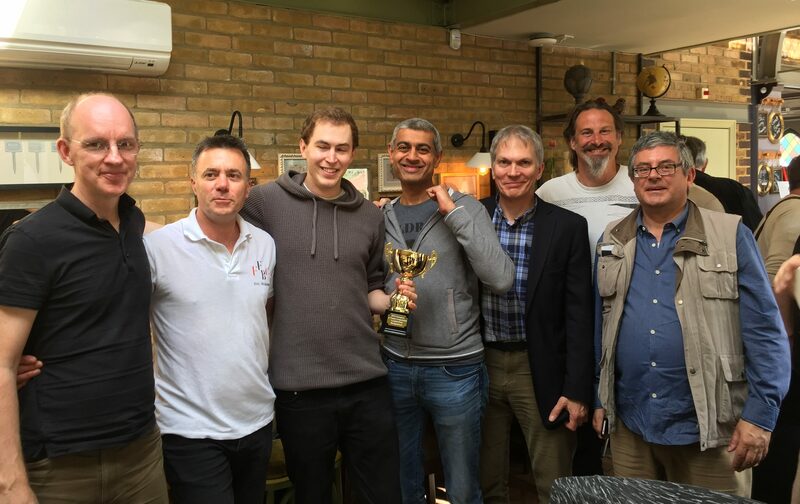 The four semi-finalists in the ‘A’ competition were all London players: Seb, Raj, Eric and Peter with Seb emerging undefeated over the both days as the individual winner. 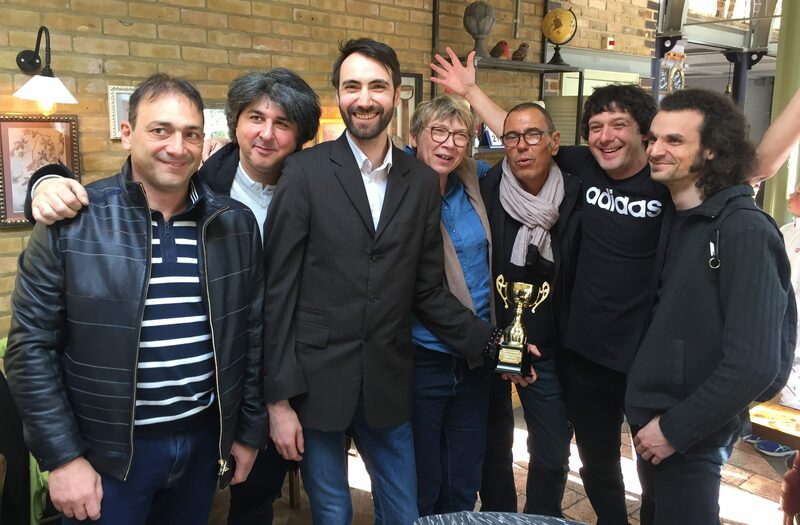 The final consultation match became irrelevant to the outcome as London A had already won, but it was played anyway, for honour….and a round of drinks! This was recorded and analysed by Dicky Biddle, and might even be published at some point. In the B division, the away team was victorious, and Romeo Lup also triumphed in the singles. However due to, er…an administrative slip-up, I accidentally took home Romeo’s trophy from the venue at the end of the day along with boards, clocks and other equipment. Fortunately, Romeo was staying on in London for a couple of days and, with the help of David Dennis, I was able to arrange a second presentation at Euston station 48 hours later! 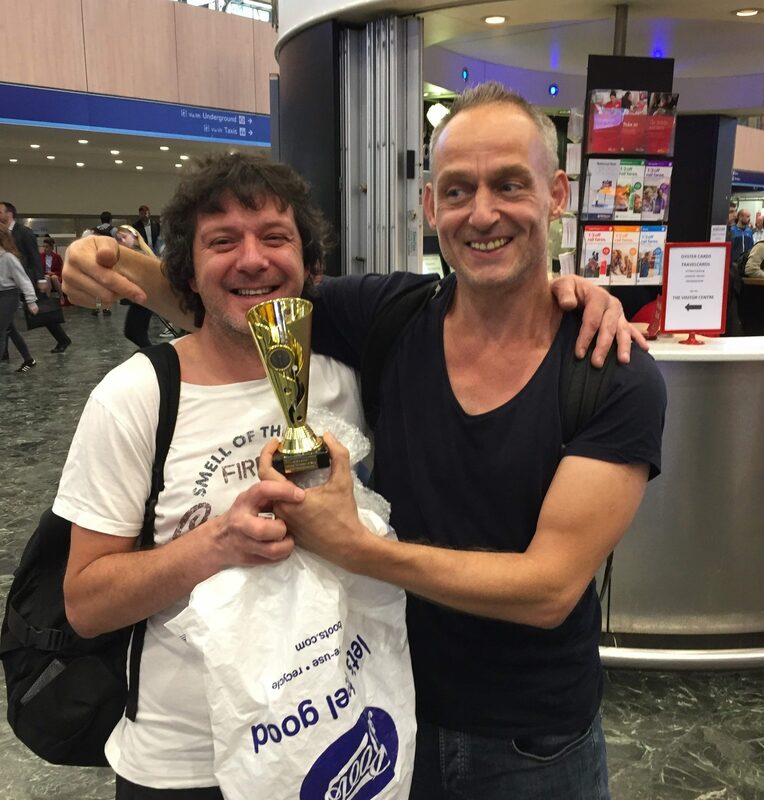 Individual B team winner Romeo Lup receives his trophy….again….this time at Euston Station! The event is now so well-established that it would be unthinkable not to send teams over to Paris again next year. Watch this space….